What happens in a fertility clinics? When a woman undergoes in-vitro fertilization, she is given medication that causes her to produce perhaps two dozen mature ova. These are extracted and then fertilized, usually with sperm provided by her husband, male partner, or friend. 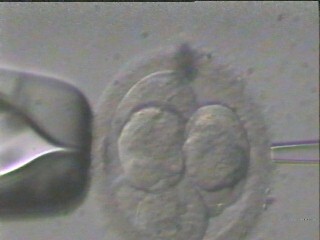 About three days later, surviving embryos develop to the blastocyst stage. They consist of a collection of 4 to 10 undifferentiated cells. This photograph shows a seven-cell embryo held between two micro-pipettes. In this case, portions of six cells can be seen; the seventh is out of view behind the remaining cells. Two to five days after fertilization, one or more of the healthiest embryos are selected and implanted in the woman's womb, in the hope that one or two will develop into a single newborn or twins. The rest are quickly deep frozen in liquid nitrogen for potential future use. These are sometimes called "pre-embryos." They have no brain, central nervous system, eyes, heart, lungs, or other internal organs. They have no organs to see, hear, touch, taste; they lack a body, head, arms, legs; they have no self awareness, memory, thought processes, or consciousness. They are smaller than a pin-prick. They consist of a number of identical, undifferentiated cells that contain human DNA. They do have a chance to grow into fetuses and become newborn babies if they are implanted into a uterus. Many, probably most, pro-lifers believe that the pre-embryos are human persons with souls. Many skeptics argue that souls do not exist -- in either embryos or adult people. Perhaps 50% do not survive the freezing or thawing process. Others will die during storage. Equipment malfunction, perhaps after decades of storage, might destroy hundreds of embryos. Some parents ask that the surplus embryos be destroyed in order to save the cost of maintaining them in storage. Some clinics simply dispose of surplus embryos without freezing them. Most couples are fertile and can have children on their own. They have no need for embryos. From the woman's ovum and/or her partners sperm, if this is possible. From the man's sperm and ova from another woman. Most infertile women and couples find these to be preferred routes, because the resultant child will genetically be partly their/her own. Sometimes women wishing to become pregnant are artificially inseminated. Again, this does not involve a surplus embryo. A very few surplus embryos are donated to research. Their stem cells are removed. The embryos die in the process. A new option has been developed, and is being actively promoted by some religious conservatives: embryo adoption.